"Looks like Mango still has a few hidden surprises. As you can see to the right, that's an official instantiation of Internet Sharing on a Samsung Focus running Mango." Good news for those of you who depend on your mobile phone as a hotspot when on the go. 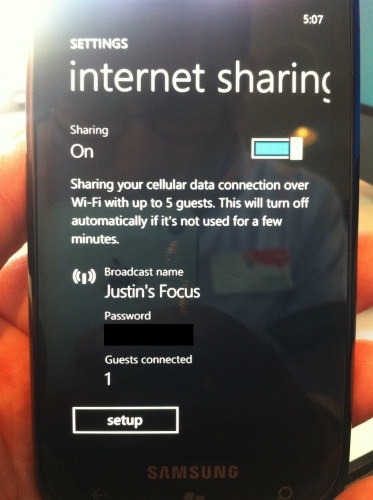 Mango 7720.68 is showing signs that hints at mobile hotspot capability in a future release of WP7.5. Of course whether this feature ultimately makes it to your phone or not will most likely be up to your carrier. I think it should be accessible by default. Every carrier charges for this IIRC, (even if there are ways around that) so it would seem beneficial to show it. When the last iPhone update got tethering, the control panel showed up, but if you try to turn it on with AT&T and don't have a tethering plan, they pop up a message suggesting you go to your account and select that service (for an additional $20/mo and including more data). Seems like it would be to the carrier's advantage to show the option, even if they don't let you use it without paying for it. Now, whether having to pay extra to share the stream of bits coming to your phone is right, that's a different argument. Especially with limited data plans. If I buy a ten piece bucket of chicken, they don't ask, are you going to eat this yourself or share? Oh, you are going to share? Then we have to sell you a 20 piece for twice as much........ Why? It's my bucket of chicken. If I want to share my 10 pieces, I understand everyone gets less and I run out faster. So? No difference to the carrier. Because see, bandwidth is a virtual good. If you pay $10 for your bucket of "chicken", but have to finish it there, you'll likely only "eat" half of it. Since this "chicken" is virtual, they'll just take it back from you and re-sell it for $10. But if you bring the "chicken" back home, chances are you'll finish it all, so there's no way they can re-sell it, so they charge you a higher price. Buying a SIM free iPhone and save that amount plus when a new model arrives the device could be sold on Ebay. It is time that US customers realize what the "Subsidized" scam carried on by carriers really means for their wallet. But the chicken is virtual in the first place. They don't need to get mine back to sell the same bucket multiple times. They just need to come up with a good excuse when folks run out of the virtual chicken they paid for. In the past it is blamed on the gluttons eating more than their share of virtual chicken. Plausible with all-you-can-eat, but with finite buckets, that can only happen when overselling. In the financial world that is illegal. For airlines they can be fined and offer compensation. For carriers it is just the norm it seems. I really don't think that I would use substantially more cell data tethering than I would normally. I would either be tethering my iPad or using my phone, but not both. It is arguable that the iPad would use more data, or that I might stream more video since it is more pleasant. Doubt that I would make a significant dent on the 1.5G I have left over every month. I suppose I could work on my tethered laptop while streaming music to my phone, but I don't see myself doing that. That said, I assume others would 'share' with their friends, but with a limited plan (4G/mo with AT&T) their fun eats your money, and eats it faster, so I would expect the altruism to taper off. No argument on your last sentence. Do you know that for most US carriers, if you walk in with a phone and sign up for a SIM, you are likely winding up with a contract anyway? Read the fine print on what you sign. No monthly price difference either. T-Mobile used to be right up front with a no contract, post paid plan. I think it still exists, but you have to ask for it. There are a good number of lower cost pre-paid 'cariers', but their coverage is generally a bit lack luster. If it is good where you are and you don't move around much they are probably great, but their device offerings are usually limited too. I realize we got ourselves into this ourselves, but it is hard to actually get out of it at this point. It is not that easy to buy an unlocked device of your choice that works on the network of your choice and get a decent rate sans contract. BTW, that $20/mo had nothing to do with the phone, plan, or contract. It is what AT&T wants to tack on to the data plan you have to allow tethering. It is on top of the $20 data plan you must have in the first place, though they do up you from 2G to 4G. You can turn that on and off any time though. Last edited by Sven Johannsen; 08-25-2011 at 09:55 PM..